While conduction is the transfer of heat energy by direct contact, convection is the movement of heat by actual motion of matter; radiation is the transfer of energy with the help of electromagnetic waves. The matter is present around us, in three states, solid, liquid and gas. The conversion of matter from one state to another is termed as a change in state, that takes place due to the exchange of heat between the matter and its surroundings. So, heat is the transition of energy from one system to another, due to the difference in temperature, which occurs in three different ways, that are conduction, convection and radiation. People often misconstrue, these forms of heat transfer but, they are based on diverse physical interaction to transfer energy. To study the difference between conduction, convection and radiation, let’s take a look at the article provided below. 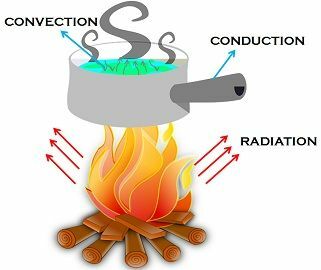 Meaning Conduction is a process in which transfer of heat takes place between objects by direct contact. Convection refers to the form of heat transfer in which energy transition occurs within the fluid. Radition alludes to the mechanism in which heat is transmitted without any physical contact between objects. Represent How heat travels between objects in direct contact. How heat passes through fluids. How heat flows through empty spaces. Cause Due to temperature difference. Due to density difference. Occurs from all objects, at temperature greater than 0 K.
Occurence Occurs in solids, through molecular collisions. Occurs in fluids, by actual flow of matter. Occurs at a distance and does not heats the intervening substance. Transfer of heat Uses heated solid substance. Uses intermediate substance. Uses electromagnetic waves. Conduction can be understood as the process, which enables direct transfer of heat through the matter, due to the difference in temperature, between adjacent parts of the object. It happens when the temperature of the molecules present in a substance increase, resulting in vigorous vibration. The molecules collide with surrounding molecules, making them vibrate too, resulting in the transportation of thermal energy to neighbouring part of the object. In simple terms, whenever two objects are in direct contact with one another, there will be a transfer of heat from the hotter object to the colder one, which is due to conduction. Further, the objects which permit heat to travel easily through them are called conductors. In science, Convection implies the form of heat transfer, by real movement of matter, that occurs only in fluids. Fluid alludes to any substance, whose molecules move freely from one place to another, such as liquid and gases. It happens naturally or even forcefully. Gravity has a great role to play in natural convection such that when the substance is heated from below, leads to the expansion of the hotter part. Due to buoyancy, the hotter substance rises as it is less dense and the colder substance replaces it by sinking at the bottom, due to high density, which when gets hot moves upward, and the process continues. In convection, on heating up the substance, it’s molecules disperse and moves apart. When the convection is performed forcefully, the substance is compelled to move upwards by any physical means such as the pump. E.g. Air heating system. The heat transfer mechanism in which no medium is required is called radiation. It refers to the movement of heat in waves, as it does not need molecules to travel through. The object need not be in direct contact with one another to transmit heat. Whenever you feel heat without actually touching the object, it is because of radiation. Moreover, colour, surface orientation, etc. are some of the surface properties on which radiation depends greatly. In this process, the energy is transmitted through electromagnetic waves called as radiant energy. Hot objects generally emit thermal energy to cooler surroundings. Radiant energy is capable of travelling in the vacuum from its source to the cooler surroundings. The best example of radiation is solar energy that we get from the sun, even though, it is miles aways from us. Conduction is a process in which heat is transported between parts of a continuum, through direct physical contact. Convection is the principle, wherein heat is transmitted by currents in a fluid, i.e. liquid or gas. Radiation is the heat transfer mechanism, in which the transition takes place through electromagnetic waves. Conduction shows, how heat is transferred between objects in direct contact, but Convection reflects how heat travels through liquids and gases. As against this, radiation indicates how heat travels through places having no molecules. Conduction takes place as a result of the difference in temperature, i.e. heat streams from high-temperature area to low temperature area. Convection happens due to the variation in density, such that the heat moves from low-density region to high-density region. On the contrary, all object release heat, having a temperature more than 0 K.
Conduction usually occurs in solids, through molecular collision. Convection occurs in fluids by mass motion of molecules in the same direction. In contrast, Radiation takes place through the vacuum of space and does not heat up the intervening medium. The transfer of heat is through heated solid substance, in conduction, whereas in convection the heat energy is transmitted by way of intermediate medium. Unlike, ration uses electromagnetic waves to transfer heat. The speed of conduction and convection is slower than radiation. Conduction and convection do not follow the law of reflection and refraction, whereas, radiation obeys the same. Thermodynamics is the study of heat transfer and the changes related to it. Conduction is nothing but the heat transfer from the hotter part to the colder one. Convection is the heat transfer by up and down motion of the fluid. Radiation occurs when heat travels through empty space. I appreciate the website, the contents are worth reading. This article is simple and easy to understand. I like the article. Simply describe the definition and understandable in a simple language.